I’m willing to bet my lucky left testicle that you’re already a fan of Thai food. 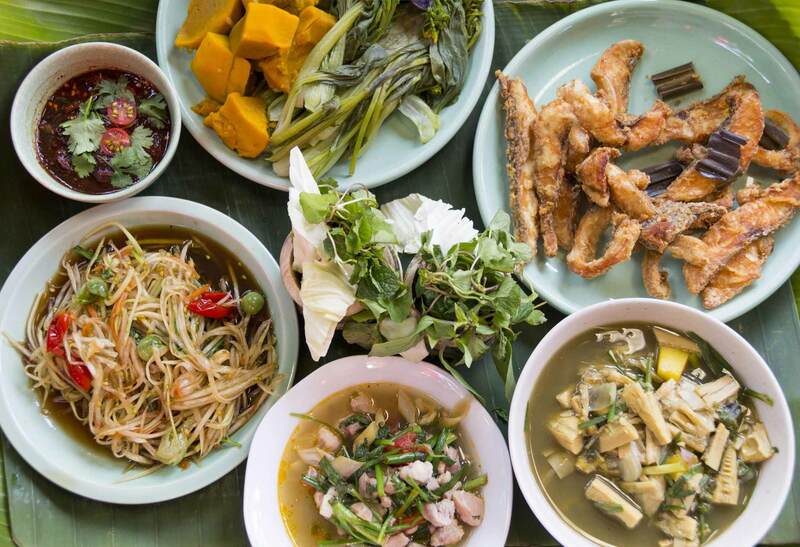 Tom yum soup, Thai green curry, sticky rice with mango, Paad Thai…is your mouth watering yet? Once you arrive in Thailand you’ll find that the range of delicious things which you can put into your mouth is far greater than you could ever have imagined. One of my favorite styles of Thai food, lesser known internationally but much-loved locally, is Isaan food. The Isaan region is found in north-east Thailand, bordering Cambodia and Laos. It’s hotter and drier than other areas of Thailand which makes it one of the poorest (and least visited) areas of the country. That being said, there are some beautiful sites in the Isaan region (and beautiful people – many a foreigner has succumbed to the charms of Isaan girls, boys (and ladyboys!)). Isaan’s most famous claim to fame (aside from country music and Muay Thai boxing) is its food. Isaan food is the fast food of Thailand. It is sold predominantly on the streets from mobile vendors at low cost (more difficult to find in higher end Thai restaurant although this dynamic is rapidly changing as more and more gain an appreciation for it). Simple in preparation but big in flavor, it’s well worth the effort to be brave and treat yourself to some Isaan street food. Believe me your taste buds and stomach will thank you. One word of warning however, Isaan food is notorious for being spicy – don’t be afraid to ask the vendor to go easy on the chili. One Isaan dish you may be familiar with is Som Tum, or Green Papaya Salad. The primary ingredient is shredded green papaya, smashed together in a mortar with all the big thai tastes – sweet palm sugar, sour lime, spicy chili and salty fish sauce. The mix ends up tangy, crisp and delicious. It’s no wonder this dish made CNN Go’s 50 most delicious dishes of the world. Som tam Thai is the plain version you may have tried. Som tam pu khem (with salted crab) or Sam tam pu ma (with fresh blue swimmer crabs) are also favorites of mine. My personal favorite Isaan dish is laab, a dish of minced meat, herbs, lime, chili and roughly crushed roasted rice. As with my men, I’m torn between which kind of meat I like best. I’m rather fond of Laab ped (duck) but I think Laab pla duk (cat fish) takes the cake. Nam tok is a dish similar to laab and just as delicious – I’d recommend Nam tok moo (pork). My mouth is watering just thinking of this! No Isaan feast would be complete without marinated BBQ chicken, a staple of every Isaan food shop, sticky rice, and the plate of fresh vegetables which comes with every Isaan meal. Writing this made me so crazy for Isaan food that I had to go out and grab some. I’ve included some photo’s – today I decided to go for Laab pla duk (laab catfish), Gai yang (roast chicken) and Som tam Thai. This is both an incredibly healthy and great post-workout meal – full of protein and all the good stuff. I bought enough to fill two people to bursting point – total cost (including the fruit for dessert) was 180bt, or around $6. You’d have to be happy with that! I’ve said it before and I’ll say it again, please don’t be afraid to eat from the streets in Thailand. Everyone does it. If you don’t, you may very well miss out on an entire style of Thai cuisine, the wonderful flavors of Isaan. You can find Isaan food vendors on most streets of Thailand. Normally you’ll be able to either eat there or take away (in which case you’ll get small packs of sauces to take with you).